Recreation of the BB-8 droid. Courtesy Daniele Grandi. Once a year, the Internet rallies together around a single cry: May the 4th be with you. May 4, 2015—“Star Wars Day”—is here. Since 2011, May the 4th has been a holiday in some of the nerdier corners of the Internet. The first organized celebration of what’s come to be called Star Wars Day took place in Toronto, Canada, and included trivia, costume contests, Web-based mash-ups, parodies, and remixes. In the past four years, the celebration has only grown. Is it a pun so bad that you roll your eyes the first time you hear it? Yup. But it also ignites the imagination, makes you wonder about what the future of designing and making could look like, and sends grown men and women back to that darkened theater, watching those famous words appear for the first time: A LONG TIME AGO. IN A GALAXY FAR, FAR AWAY . . . But isn’t Star Wars really made up of all the technology that everyone—from children to adults—wish we had today? Does the future of making things really have to be that far off into the future? Some colleagues and I looked to future designers and makers to think about the problem, asking them to re-create favorite technology from the Star Wars universe to share with fellow nerds and designers around the world. X-Wing fighter simulation. Courtesy Autodesk. Inspired by the idea, a group of students and Autodesk interns imagined a new way to celebrate May the 4th and be a part of the future of making things. Within a day, renders and designs created in Fusion 360 and Inventor began to flow in. From the droid that’s inspired more than 100,000 tweets to a simulation of an X-Wing fighter flying, it was clear: These were the students I was looking for. Daniele Grandi, an Autodesk Student Expert and mechanical-engineering student at UC Berkeley, re-created BB-8, the spherical droid that’s stolen the heart of the Internet. For the round droid, which was first seen rolling around on a Tatooine-like planet, Grandi wondered what sort of design constraints would have to be placed to make it function so well in an arid climate. That got Grandi wondering how hard it would be to make BB-8 move, in case it wanted to take a quick trip down to Tosche Station to pick up some power converters. Modeling it turned out not to be too difficult after all. One part of the Star Wars galaxy that everyone has imagined is the lightsaber. In the first teaser trailer for Star Wars: The Force Awakens, there was a brief moment when a new style of lightsaber appeared. If you follow these sorts of things, then you know exactly what I’m talking about. 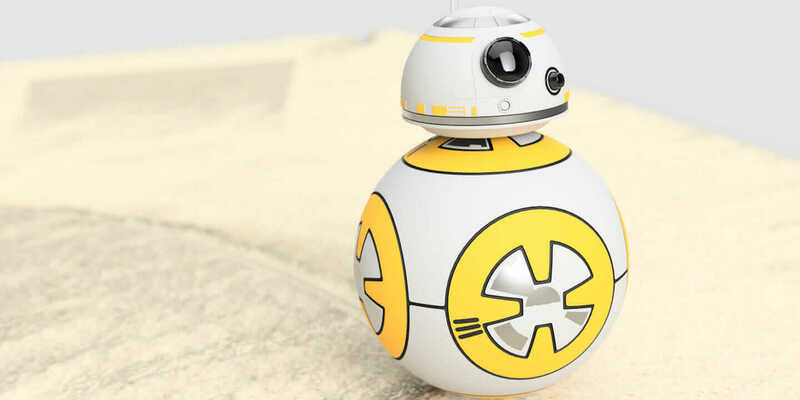 The BB-8’s rotating ball easily takes on difficult terrain. Courtesy Daniele Grandi. Undeterred by the mixed reaction the claymore-style lightsaber received, Ethan Ouimet from the University of Oregon created a 3D CAD model of the lightsaber. But he wasn’t satisfied with that. To really get a sense of what it’d be like to have a lightsaber with three blades, he called upon fellow student Eric Thomas to 3D print the weapon. 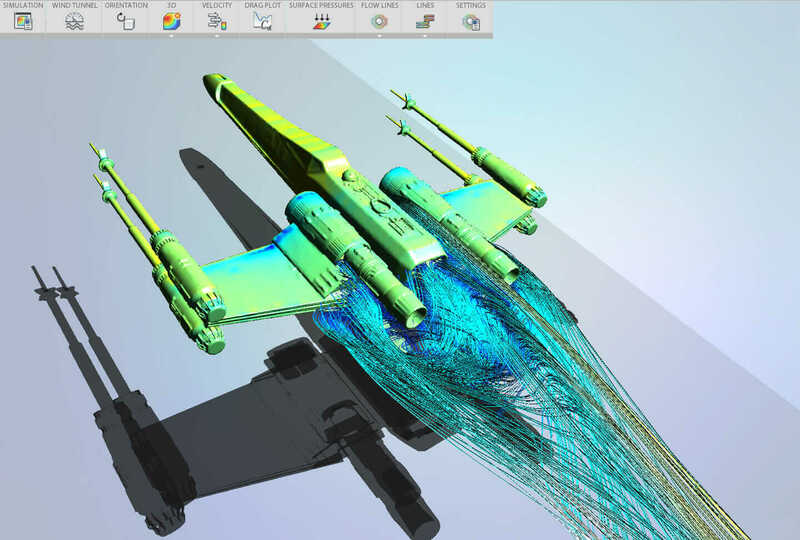 Not to be outdone, the Autodesk Simulation team revived the classic X-Wing fighter from Episodes IV–VI and put it through our wind-simulation software to see how it would react to traveling through a more Earth-like atmosphere at 700 MPH. What they found is that the flat wall at the back creates a large wake region that could ultimately impact the flight performance in an atmosphere. But in the vacuum of space, there’s no air to flow around the fuselage, and, in theory, shouldn’t impact the flight. Maybe next year, Autodesk will design a solution that will help make an X-Wing’s flight in atmosphere a little smoother. In the meantime, the Star Wars maker obsession doesn’t end with students. Working from the Office of the CTO at Autodesk, Ethan Atherton milled and 3D printed much of the pink R2 for his movie, Artoo in Love. And Autodesk software architect Kean Walmsley built his own Death Star using AutoCAD and 123D Make. In celebrating May the 4th, Star Wars fans and makers have done more than think about how to design a robot in a piece of software or use additive manufacturing to create the hilt of a lightsaber. They’ve cast their minds forward to think about what the future looks like, how to interact with it, and how the limits of imagination can be stretched to live in a future that, in the past, was reserved only for the silver screen. Additional reporting contributed by Blake Menezes. If you are a student interested in getting free access to design, animation, and engineering software, learn more at the Autodesk Education Community site.